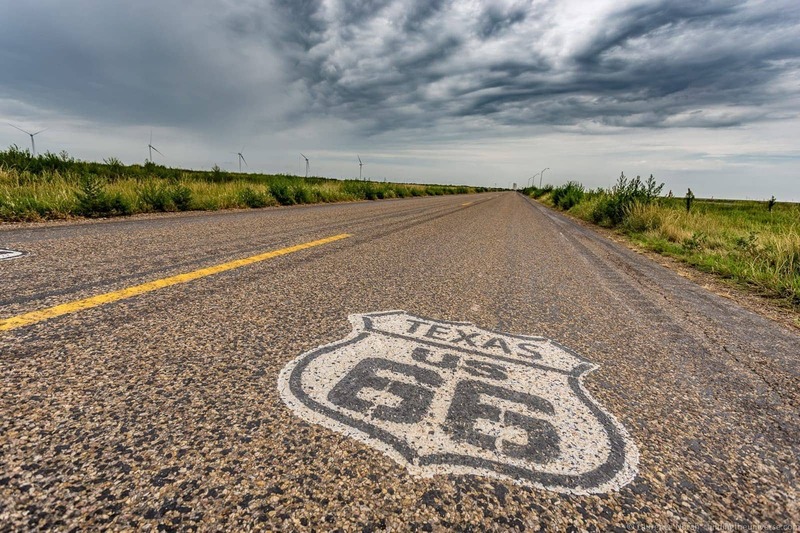 Home » Destinations » North America » USA » Route 66 in Texas – All the highlights! From New Mexico, our 2000+ mile Route 66 adventure continued on into Texas, the fourth state on our trip, where Route 66 covers just under 200 miles. We had much better weather here than in New Mexico, with (mostly!) wide open blue skies to accompany us on our journey. 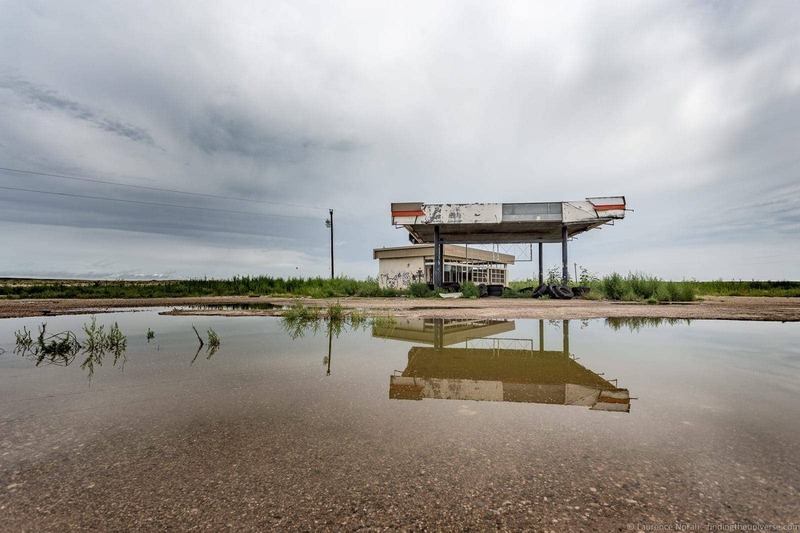 Here are some of our favourite photos from our Route 66 journey across the Lone Star State! 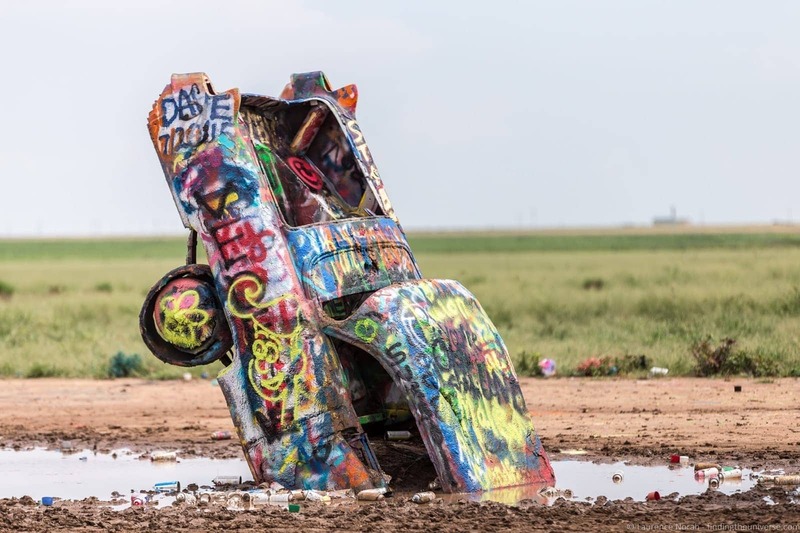 A definite highlight of Route 66 in Texas, if a slightly odd one, is the Cadillac Ranch, not far outside Amarillo. 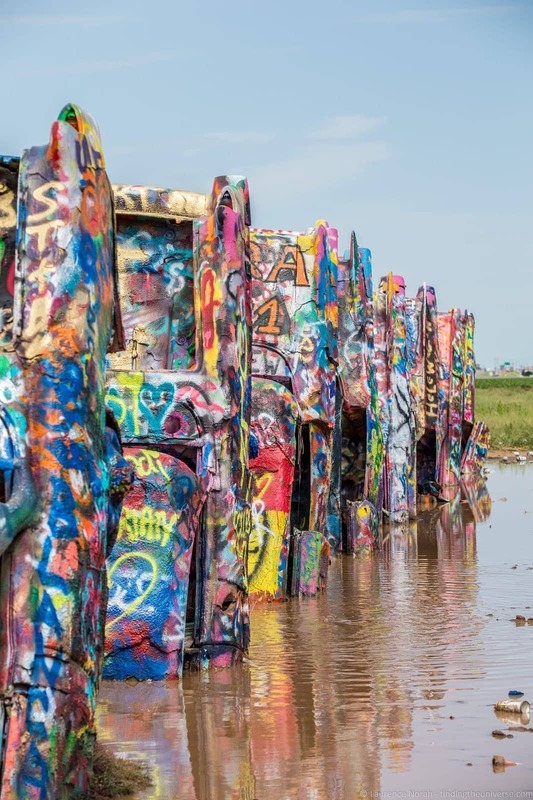 This is a public art project, installed in 1974, featuring a series of old Cadillac cars buried face down in the mud to create what look a bit like a line of standing stones. Except they’re Cadillacs. The exhibit is interactive, in that visitors are encouraged to add to the paintwork with their own designs, which plenty of people were doing. Unfortunately, this does mean it’s surrounded by old paint cans. Still, worth a visit – it’s quite a surreal sight! 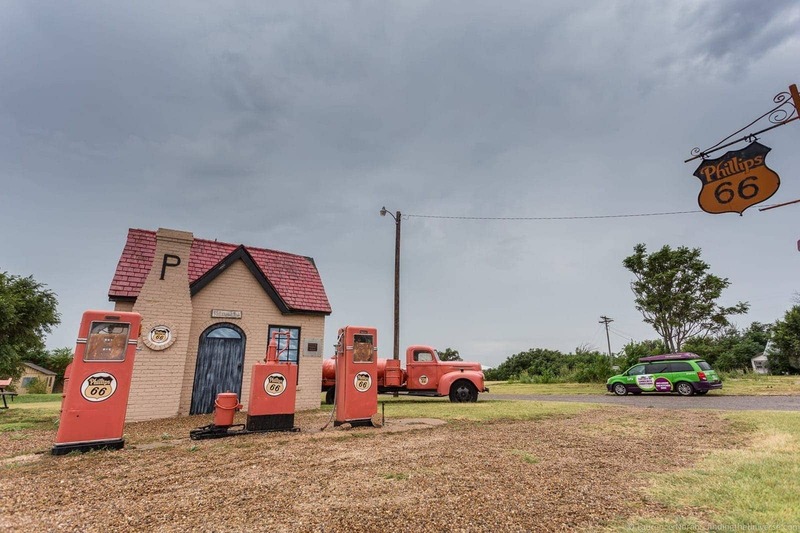 If you’re not into Cadillacs, you just follow Route 66 a little further East, and you’ll come to the VW ranch – a similar but somewhat less visited (and somewhat more overgrown!) installation, which is essentially the same thing but with VW Beetle’s instead of Cadillacs. So whatever floats your boat really. Looking for something with a little more religious significance than some painted cars? 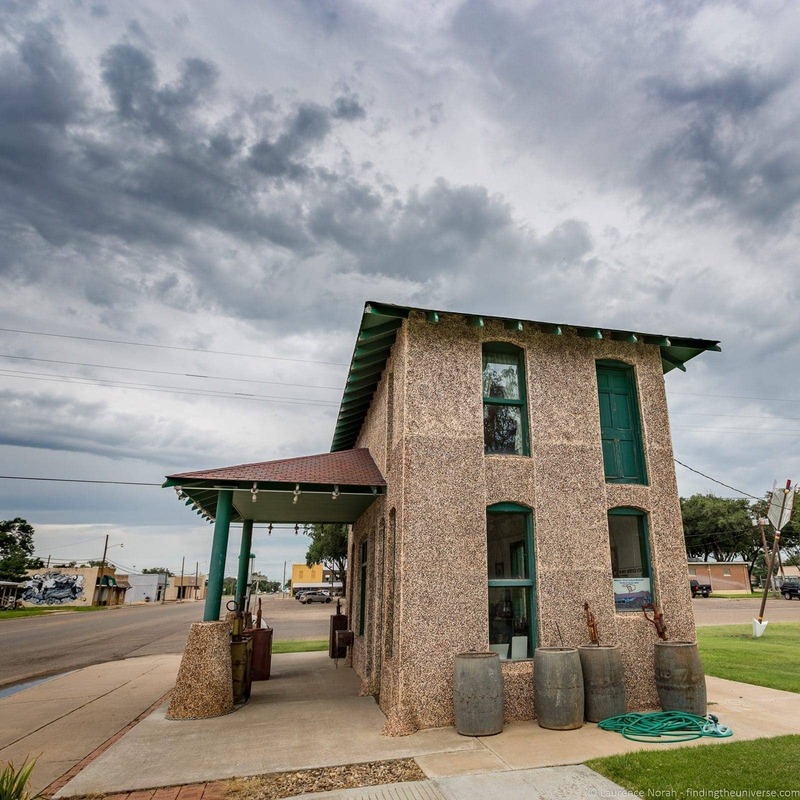 Well, the town of Broom in Texas has you covered. As well as a famously leaning water tower, this tiny town is also home to a 19 storey high cross, which is one of the largest in the western hemisphere. 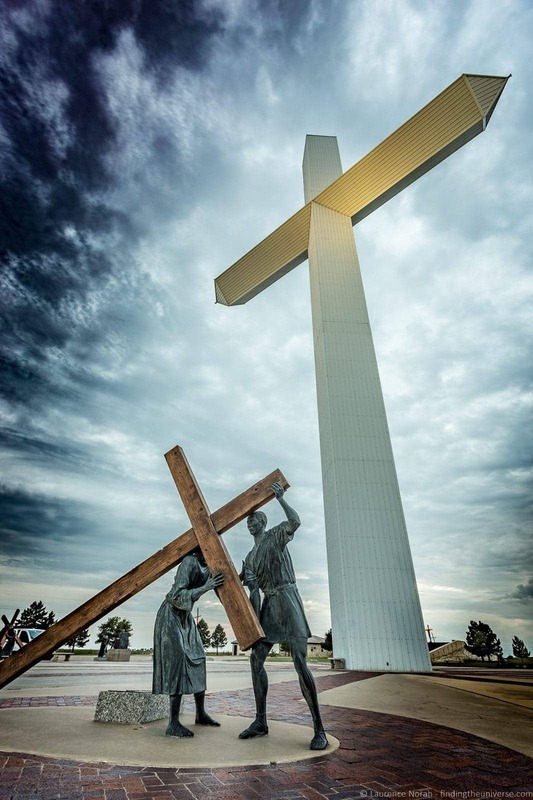 The cross is surrounded by life sized statues depicting the stations of the cross, and overall is an interesting place to visit even if just to marvel at the sheer scale of the construction. 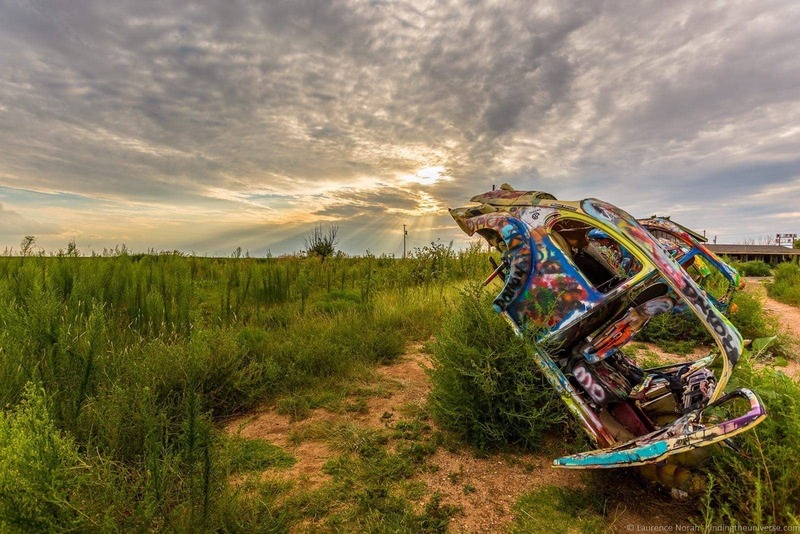 Of course, Texas doesn’t escape the Route 66 “Cars” connection. 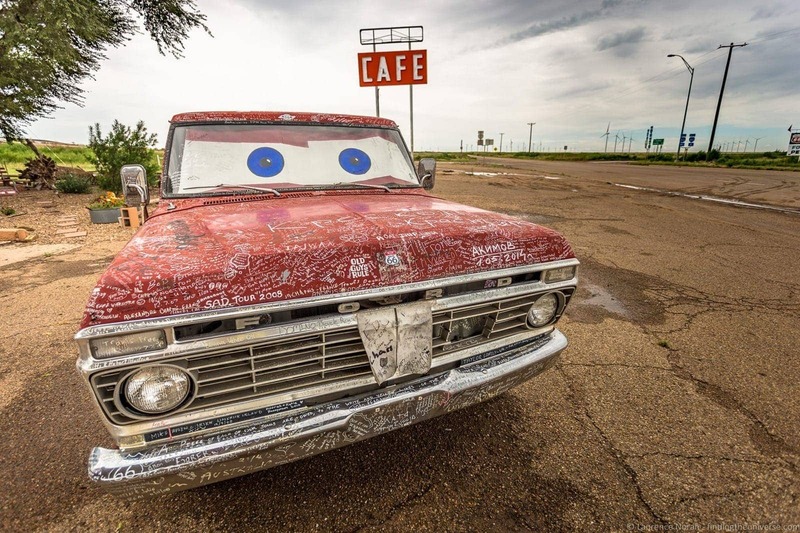 This old Dodge had hundreds of scribbles on it from travellers taking their Route 66 adventure – all you need is something to write on inscribe with, and you too could have your own inscription! Route 66 has to have a halfway point, and this was it, with LA being 1139 miles in one direction, and Chicago 1139 miles in the other. There’s a cafe and a line in the road to mark this point, although naturally its exact location is disputed, what with the many reroutes and versions of Route 66 over the years. Everything in Texas is bigger. It’s just a fact. 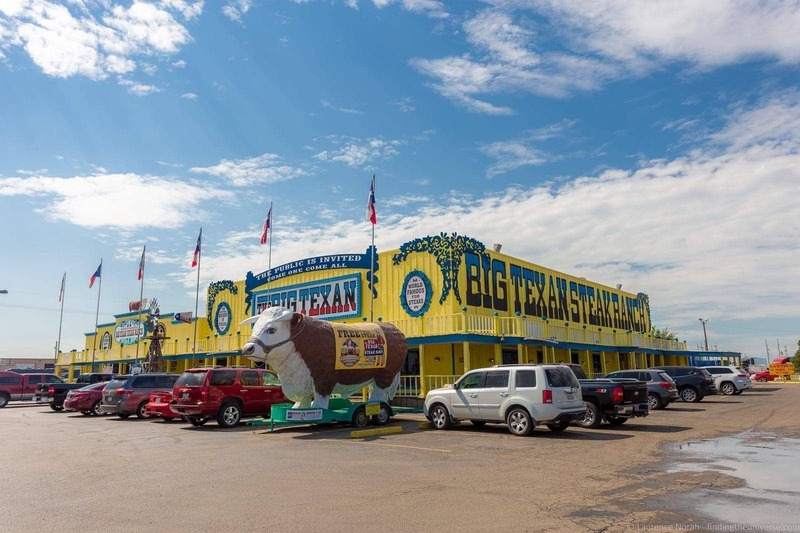 As you drive along Route 66, giant signs start to appear the closer you get to Texas, advertising a 72oz steak, which just happens to be free. This is available at the Big Texas Steak House, a Route 66 staple. The sign does point out a couple of terms and conditions – for the steak to be free, you have to eat it all, and you have to do so inside an hour, without any help. We asked our waitress if many people achieved this, and she said that no, most people did not. But many people certainly tried! 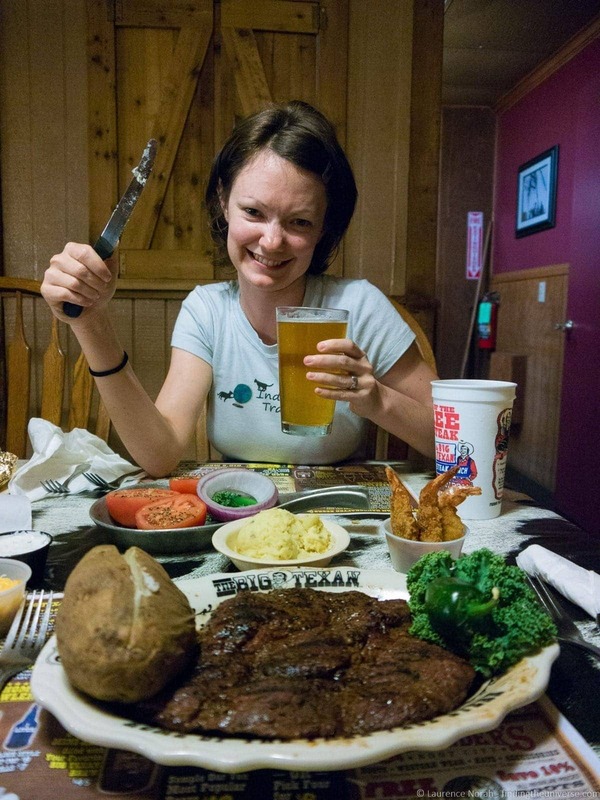 We decided that a 20oz steak between the two of would probably suffice, and it did, with spare to take on our trip with us! It was very good, as Jess’s smile attests! .and others have been ravaged by time, with the coming of the interstate killing them off entirely. And on that note, we’ll wrap up this post. 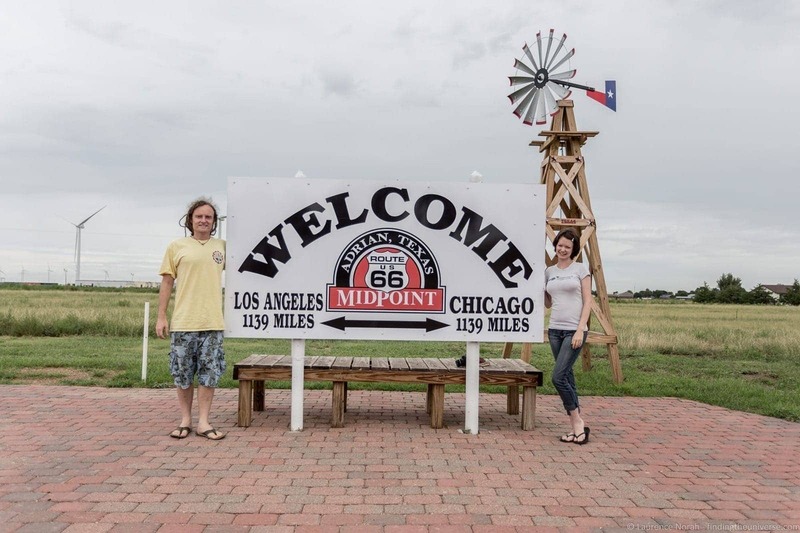 Still to come the last four states on our epic Route 66 adventure, including Kansas, Missouri, Oklahoma and Illinois. Lots more photos to share with you guys!